If you have a Ruby Tuesday near you and you are on the keto diet, you need to take advantage of it. There are some serious Ruby Tuesday low carb options and this article will take you through them. Alright, this is a great option for anyone on keto. 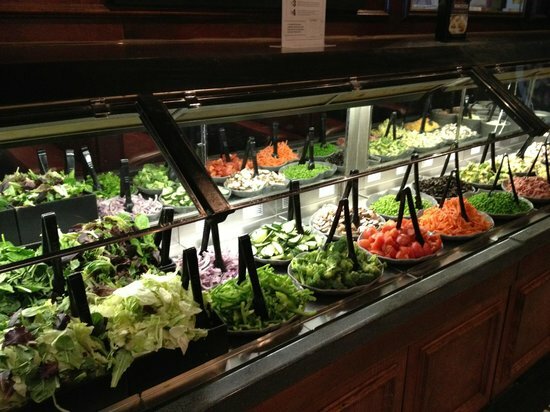 It’s a salad bar loaded with options. If you don’t know which vegetables you need to eat when eating low carb, you can check out this article about which vegetables to eat on keto. Obviously you have to avoid things like croutons. Then there’s the salad dressing. Most of their salad dressings have low carbs. As usual, you’ll want to avoid Catalina and honey mustard, but there are several good options: ranch, balsamic vinaigrette and olive oil & vinegar are all 2 cars or below per 1 oz. serving. There is even a dessert option that is 18 net carbs. It is the “Berry Good Yogurt Parfait.” That’s pretty high and most keto dieters look to avoid that many carbs, but if you clear out the rest of your day, you can do it! If you have any other questions about the carb content at Ruby Tuesday, here is an awesome nutrition calculator that lets you tally up the total carbs of any of the items on their menu.